Here at Living Springs we had a good start to 2012. We have been blessed abundantly by our Lord. We are now enjoying the dry season, and with it, the harvest from our garden. The area where we are located in Panama is called “bean country.” This year we planted seven different varieties of beans. During the planting and growing season we learned many spiritual lessons from God’s book of nature. We worked very hard, and it is so good to enjoy the fruit of our labor now during the harvest. All of these activities help us think of the future when God’s harvest is going to be gathered. Just as in cultivating beans we needed to do different things to ensure the plant growth and development and a good harvest, such as weeding and fertilizing, so it is in the medical missionary work. 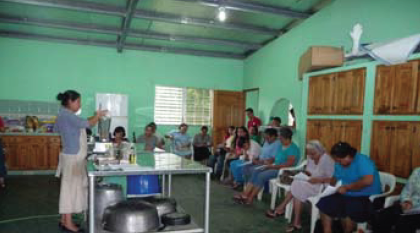 An attentive audience at cooking class in San Pablo. We are called to help different people from different walks of life. We have had as clients here at Living Springs people ranging from a well-known ex-politician from another province to the humble peasant that has nothing to his name. We also have been called to work with other Adventist health professionals at a health fair. It was very successful. Pablo was able to help many people with back problems. Zaida did nutritional counseling. We continue to get calls to have cooking classes. This time even pastors are calling. Praise the Lord! With the local church, we were involved in literature distribution, an activity that was done at the Union level. Helping in the distribution of Great Controversy books. 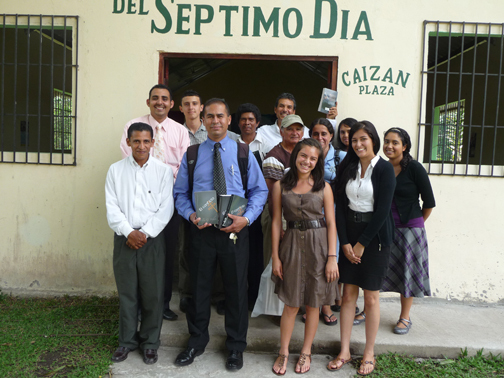 Thousands of Great Controversy books were distributed here in Panama. As far as we know, the books distributed were well accepted. The girls continue to be involved in child evangelism with the church. All the areas of service we are called to do will help to ensure a successful harvest when Jesus comes to gather His harvest. Our first impression during the meeting was that the girls did not want to be in the meeting. After a while, they warmed up to us and freelyshared their comments about their friends and their struggles. Later, Brother Rolando told us how, during Sabbath school that week, the older of the two girls had stood up and had given her testimony. She told the church members how thankful she was to have consecrated teachers and parents that care about her and also gave thanks for a couple that took the time to meet with her family and give counsel on how to meet the challenges they were having at the academy. We say, Praise the Lord! He is using us as a tool to bring “bread in due season” in an area that is badly needed. Brother Enrique and his wife. He is back to his usual activities after God healed his back. One of our recent patients was Enrique. Enrique was baptized in our church about three years ago, but he backslid. Recently he injured his back. He had been going to the doctor because of severe back pain. He was only given pain medicine and sent home. Several times he went to get injections for pain but had no relief. His wife finally called us. Pablo went to Enrique’s home to give him therapy. When he first saw him, Enrique could hardly stand up, and was dragging his left leg when attempting to walk. He was under severe pain and had not been able to sleep for several nights. Besides the therapies, he was given herbs for inflammation and pain. 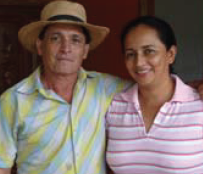 Pablo prayed with him and encouraged him to put his trust in God. The Lord blessed tremendously. After a week of treatments, Brother Enrique was able to join us in church. He was walking normally. He continues to study the Bible and had stated that he will start to keep the Sabbath again. Please continue to lift us up in your prayers. We are frequently called to help individuals with severe illnesses, and we need God’s wisdom to know how to counsel the people that call or come to Living Springs. Some have serious problems and are looking for alternatives to treat their illnesses. One example is a lady that called us few days ago. She has diabetes and kidney failure. She told us that she was taking Lasix (a diuretic), 2 capsules 3 times a day, and was urinating very little. She felt tightness in her heart and chest. She told us, “I keep drinking and drinking water and I don’t know why I do not urinate and my legs are swelling.” She had been discharged from the hospital two days before, and the day after being discharged she had to go to a clinic to receive Lasix by injection and was placed on oxygen. When we encouraged her to return to the hospital, she pleaded that she wanted to come to see us. She stated, “I know you will give me something, and I will be better.” Our recommendation was still for her to return to the hospital. Before she finished her phone conversation she asked what she could take so she could urinate. We mentioned that she could make tea of corn silk. At the same time she was told to seriously consider going back to the hospital if she was having so many problems. We did not hear from her for two days. We decided to call to see if she had followed the recommendation to go to the hospital. When we called, her daughter answered the phone. She told us that her mother was doing very much better. She had drunk the corn silk tea and was urinating a lot. Her swelling was getting better and her breathing and chest congestion were better. They were making plans to come to see us and have a full consultation to learn what she could do to regain her health. They wanted to learn more about what to do naturally to recuperate. We thank the Lord for His mercies, and how He is blessing the humble work that is being done. God is going to finish the work with simple means. He tells us, “If we neglect to do that which is within the reach of nearly every family, and ask the Lord to relieve pain, when we are too indolent to make use of these remedies within our power, it is simply presumption. The Lord expects us to work in order to obtain food. He does not propose that we shall gather the harvest unless we break the sod, till the soil, and cultivate the produce. Then God sends the rain and the sunshine and the clouds to cause vegetation to flourish. God works and man cooperates with God. Then there is seed time and harvest. God has cause to grow out of the ground herbs for the use of man, and if we understand the nature of these roots and herbs, and make a right use of them, there would not be a necessity of running for the doctor so frequently, and people would be in much better health than they are today.” Medical Ministry, 230, 231. Thank you for your prayers and support, and may we all do our part to secure a great harvest for the Lord. By Zaida Acosta and Robert Ice. Email: 4asaved2serve@gmail.com.